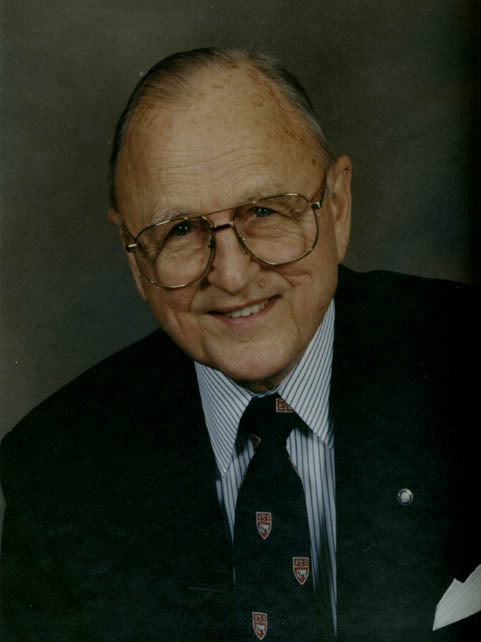 Dr. Harold L. Boyer was born 22 May 1916 in Hartman, Arkansas, a town of 600 in the Ozark foothills near Clarksville. Hartman had been established in 1875 by the Missouri Pacific Railroad in an agricultural area with coal mines nearby. He delivered five metropolitan newspapers beginning at age six. After his physician father’s uninsured drug store-doctor’s office burned in 1929, the family moved from Hartman, Arkansas to Ft. Towson, Oklahoma. His father took over the practice of a recently deceased physician. Ft. Towson also had only about 600 souls but had a sawmill. However, when the nearby timber had been cut, the sawmill closed in the midst of the Depression. Harold graduated from Ft. Towson High School and then studied three years at the University of Oklahoma in Norman before attending the University of Oklahoma Medical School in Oklahoma City from 1937 to 1941. Like many others during the Depression, he worked to finance his education. He was an intern in New Rochelle, New York for the princely salary of $25 a month for the first six months and then $50 a month (many internships paid only room and board). After Pearl Harbor, he joined the Navy because he didn’t want to walk. In June 1942, he went to the U.S. Naval Hospital in Corpus Christi, Texas for six years and was then assigned to the Pacific Fleet Marine Force at Camp Elliott, San Diego, California in November 1942. Dr. Boyer served with the Marines at Guadalcanal for two months and then at Tarawa. His request to be a flight surgeon took him to Pensacola, Florida. After World War II, Dr. Boyer was a dermatology resident in St. Louis. He married his wife who was a doctor’s receptionist in St. Louis. He returned to Oklahoma City for a few months and practiced in Enid, Oklahoma for nine months when he was recalled to active duty in the Navy for the Korean War. After the Korean War, he was a “coal mining doctor” in Birmingham, Alabama while looking for a permanent place. In 1952 he took over the dermatology practice of Dr. Carver Coffman who was returning to the Air Force in Las Vegas. Dr. Boyer was a proud civic booster. He was active in the Boy Scouts of America. He was president of the Las Vegas Rotary Club when they hosted the international convention in 1975. The nature of his practice led to an interest in cancer. He became involved in the Clark County branch of the American Cancer Society, then president of the Nevada division and on the American Cancer Society national committee. Dr. Boyer was a long time secretary-treasurer and president of the Clark County Medical Society. He and his outgoing wife, who had been a Bonanza Airline stewardess, were patrons of the July Bailey Theater as well as other programs at the University of Nevada at Las Vegas. They had a daughter who is a teacher and a son who is a lawyer.